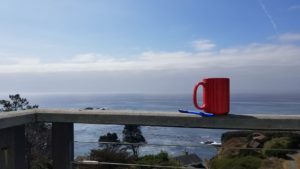 September 26 – 29: How does a long weekend in a house within walking distance of the ocean feel, where someone else takes care of the chores and the cooking while you daydream, write, and build lasting friendships with other writers? Join us and find out just how crazy good it can be to escape from the hustle and bustle of everyday life. 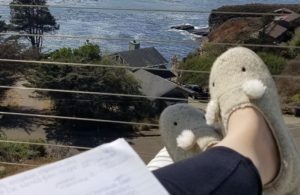 If you have a writer in your soul yearning to be by the sea, this 3-day retreat on the Northern California coast might just be exactly what she needs. Begin before we begin; let the scenes sliding past your window on the drive up inspire your sense of adventure. Let the waves crashing on the beach reinforce the joy of your big idea. And let the muted, muffled sounds of sea, sun, and gentle surf caressing the thick, warm sand remind you of the power of shared human experience. Embark on a journey into taking your storytelling from surface to soul, where the rewards inherent to this risk are waiting to be discovered. Arrive Thursday evening for dinner, games, and a Late Night Write in PJs. Wake up to coffee, tea, our rather excellent cook’s rather excellent breakfast, and two full days of writing. Choose your path: Explore the how and why of writing with depth, emotion, and layered meaning and experiment with taking scenes and short stories to deeper places, or work independently to achieve your own set of goals. If you’ve been told to go deeper with your writing, but have no idea what that means for you, let’s roll up our sleeves and figure it out. 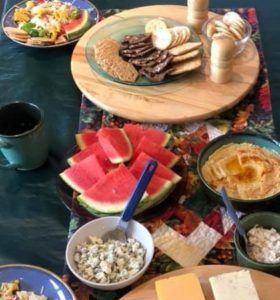 Arrive between 5 and 8 p.m. Thursday night to settle in and enjoy dinner with the group, followed by a round or two of warm-up games (Balderdash or Taboo), and a late-night write in PJs for a couple / few hours. We begin each morning with movement and inspiration. Choose a group walk or yoga before breakfast, or sleep in and meet us at the table at 9 a.m. This is where we discuss our goals and intentions for the day. Your presence is important for fostering a strong and successful group dynamic. There are plenty of opportunities for personal time throughout the day. By 10 a.m. we’re all washed, watered, fed, and ready to go. It’s my job to reign in your attention and keep you focused on your reason for being on retreat with us. If you slip easily into your work without my help, do so happily. 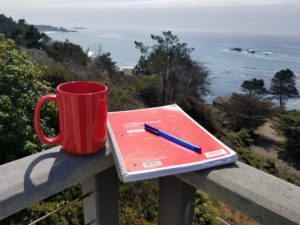 If you need a little prodding, I’ll help you draw from our breakfast discussion to tease ideas and inspiration into the essential building blocks of the day’s writing. We brew tea for elevensies, because we’re fancy like that, but don’t stop what you’re doing just for this — unless you’re having trouble getting into your writing and could use help. Snacks are available all day for grazers. Lunch is served at 1 p.m. We’d love to eat with you, but if you’ve found your flow, flow on without us. At 2 p.m., it’s time to settle in for three hours of serious, uninterrupted writing time. Morning chatters become afternoon workers. Morning workers keep it up or break for a walk to the waves. Your writing coach, Bronwyn Emery, will check in on you individually throughout the day and make herself available for one-on-one coaching. She’s there for you. Bounce your ideas off her, ask for a structure check, celebrate a breakthrough, vent about a storyline, or ask for whatever you need related to your current writing project. Let her know how she can serve you. At 5 p.m., it’s Happy Hour! Fresh snacks and wine or a cocktail, if that’s your thing, and the chance to share your work with a friendly and attentive audience. Officially, we’re done writing until after dinner, but don’t let us stop you from continuing inside with your earbuds and your muse. Feel free to wander off to enjoy time to yourself and get ready for dinner. Dinner is at 7 p.m. Thursday night, we’ll have food ready for you. Friday night, we’ll enjoy a potluck meal and Saturday night, we’ll either dine out at a local restaurant or dine in on leftovers. These are required gatherings where we come together to recap the day, track goals, take a look at the next day’s agenda, and get to know each other even better than we already do. After dinner, you’re welcome to zone out, do your own thing, socialize, or embark another late-night write in PJs by 9 or 10 p.m.
Because we know traffic can be a real challenge, we invite you to check in any time you can Thursday evening between 5 and 10 p.m. We must vacate the premises by 11 a.m., and something always goes wrong at the last minute, so please be ready to check yourself out no later than 10 a.m. Sunday. Any later than that and you’ll be roped into doing chores, and is that really how you want to spend your last hour on by the waves? Email Bronwyn Emery at info@toliveandwrite.org to apply for your place in the Write to the Waves retreat. 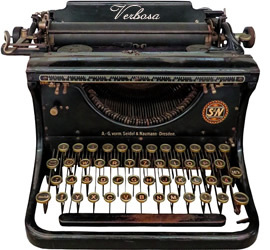 Take this opportunity to feed and pamper your writer self like you’ve always promised. 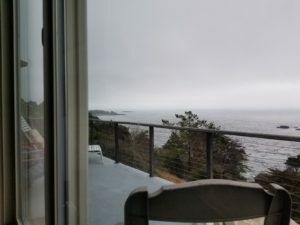 Write by the Waves with us in Sea Ranch this September. *sleeping options are sleepover-style and range from standard mattresses to sofas, sleeper sofas, futons, and air mattresses. 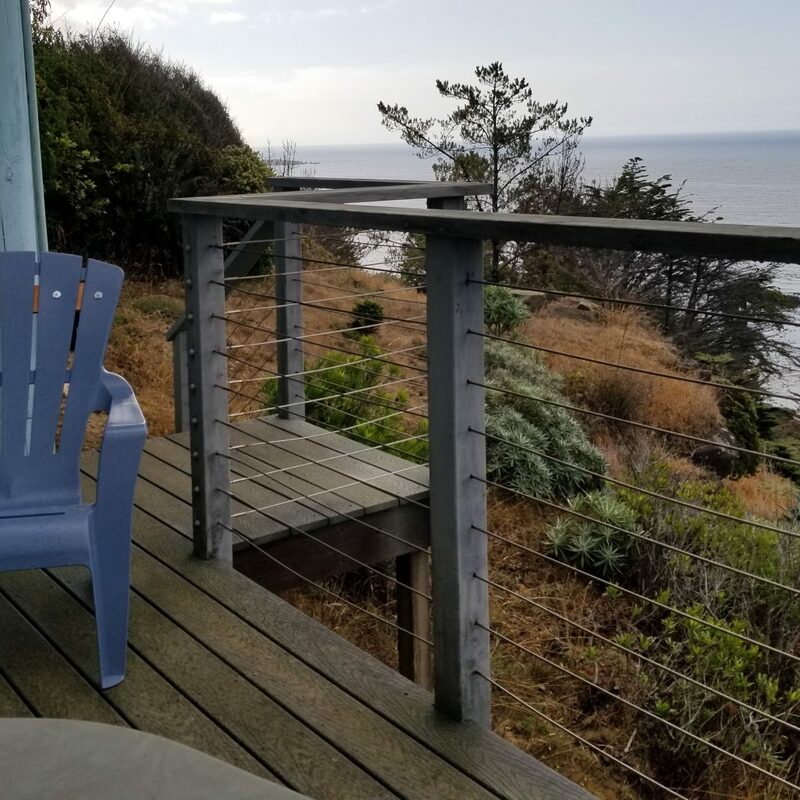 This location offers private rooms and some private bathrooms, but you might be asked to share a bed, sleep in the living room, or bunk up in a room with another writer.